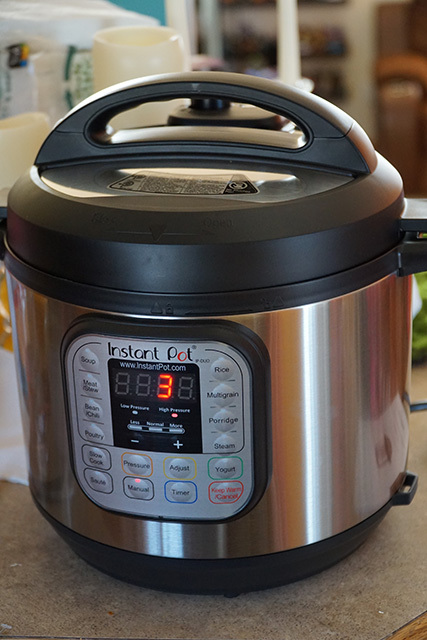 Okay, so I finally did it… I bought an Instant Pot. I’m sure you’ve heard of it, unless you’ve been living under a bridge, in which case you should maybe rethink your life choices because I can think of much better places to reside. Anyhoo, I decided for it’s maiden voyage that we would make mac ‘n cheese because it’s something everyone loves and it seemed simple enough. I apologize in advance for not taking more pictures… if you are ever at our house during mealtimes, you’ll understand why it’s sometimes very difficult to take photos between the distractions of cats and children. Bottom line, it’s so easy to use and I love all of the settings and how big it is. Now… is it actually quicker? Usually, if only by a few minutes. The one thing you have to take into account is that while it may only take a few minutes to cook something, you have to add in 10-15 minutes for it to actually reach pressure before it starts cooking and then another 10 minutes I think for the pressure to naturally release (NR). 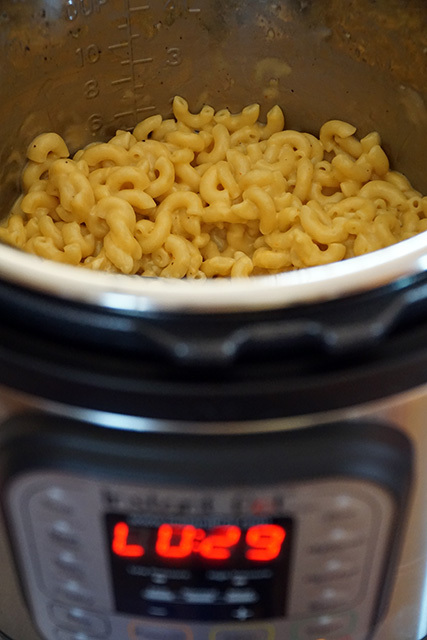 This recipe called for Quick Release (QR) and I was not prepared… I had to quickly get a towel to cover up a 3 foot steam geyser of a combination of water and butter (which the noodles had been cooking in). It was messy to say the least. All in all, though, it took about 15-20 minutes tops to make and it made a huge amount and was super tasty. I’ve also done hardboiled eggs and they came out almost perfectly… I think I could have done a minute less. I’m excited to try a whole chicken and I also love that I now have a second slow cooker, because you can use this for that as well! I can’t wait to try the saute feature and I’m going to try my hand at yogurt soon too, so I’ll share how that turns out. Did I mention it’s easy to clean too? I think even easier to clean than our rice cooker, so we may get rid of that eventually. I’m really excited about this kitchen gadget. This entry was posted in food, gadgets, house stuff and tagged food, instant pot on April 18, 2017 by Heather Shoberg.